Repudiation rally against the Ladies in White. Photo taken from Bitacoras website. Yesterday, February 23, 2012, for a second time, Cuban TV has honored me by exposing my image — along with those of several other independent journalists and dissidents — in the national news. The previous occasion occurred months ago, during an unfortunate program televised through the famously dull Roundtable, regarding an alleged cyberwar that the everlasting CIA was orchestrating (who? ), serving the interests of (the same villain!) the U.S. government, which is always called “the North American government” as if Mexico and Canada were just simply northern provinces. I’m not going to wear myself out with accusations of defamation, misrepresentation and misuse of my image to a government that has never had the decency to acknowledge their responsibility for crimes far superior to these. The executions, the senseless Cuban deaths due to adventures of war in other countries when Soviet subsidies allowed the feeding of the egomania and megalomania of the interventionist F. Castro, the torture and deaths of political prisoners throughout the so-called “Revolution”, the events* at the Psychiatric Hospital of Havana in January 2010, more than five decades of systematic destruction of a nation as a whole, the separation of tens of thousands of families by permanent exodus, the debt irresponsibly imposed on present and future generations, and many other sin whose list is endless, sins that dwarf any official insults to a few people. If there were not the possibility of some dark maneuver of the well-known style of repression that consists of demonizing citizens just before launching the blog that throws them into prisons, perhaps I should be flattered. However, since this is about the disproportionate onslaught of the longest dictatorship in this hemisphere, owner of the media, of the repressive forces, of the army and of all the power, against just a handful of citizens who have the audacity to feel themselves to be free, allow me on my personal and absolutely individual account and not representing anyone else, to once again refute the official discourse, that by repetition, demagoguery, and mendacity, has not ceased to be unhealthy. And given that, in their proverbial cowardice the authorities can’t even permit the luxury of awarding me the right to reply in their own media — for obvious reasons — I launch my dart from this blog that, obviously, has been making a dartboard for them for four years. On the morning of February 22, I attended the video conference “Press Freedom and Expression”, organized by the Office of Public Affairs of the United States Interest Section, with the participation of Luis Botello, the International Center for Journalists, Dr. Sallie Hughes, professor of Journalism and Latin American Studies, University of Miami, and Zita Arocha, Cuban-American journalist and professor in the Department of Communication at the University of Texas at El Paso. Among the topics of the conference were also social networks and the Internet, and the importance of the digital age for freedom of the press. A whole meal for those who use such means as the only space to express themselves. Just as I might have attended a similar event had it been organized by the embassies of Iran, Syria or Venezuela, or if it had been held at the Faculty of Communication at the University of Havana; but this falls in the plane of pure fiction: we know that to discuss certain topics requires democratic spaces. What first drew my attention on arriving at the site where the conference was going to be held, was the excessive display of “official paparazzi” who were excitedly rushing around with their cameras every time some participant arrived. The number of “journalists” who were government employees almost exceeded us. That, not counting the vehicle deployment occupying the adjacent areas, for a moment made me suspect that they were organizing one of their classic rallies of repudiation. I emerged from a taxi and immediately was the focus of Cuban TV cameras and other official media, which at the moment made me feel like a Hollywood star or, perhaps more suited to the environment, like a postmodern Mata Hari, such that I had to walk to the corner of 7th and 24th, Miramar, where other colleagues were waiting, to get in bright sun, take off my glasses and wave my hand at the cameras. I am a caring person, gentlemen, if I want to film me, do it well.. Nor did I have the least intention of hiding myself, given that I was not enrolled in a conspiracy in the style of the Vi Congress or the National Conference of the Cuban Communist Party. You can see how people project their own existential misery over whatever space. No, buddy, we were not at the Conference Center, and so we didn’t need tickets to have a soft drink or a cup of coffee. The servants of the Cuban government have a sick fixation on credentials, tickets, snacks, imaginary “goodie bags” with gifts and currency supposedly offered by the functionaries of the United States and certain European countries as rewards to the dissidents. It is a reflection of their own reality. However, the most favored of this incredibly miserable caste have no modesty whatsoever when it comes to exhibiting their private cars, with which the government awards the official journalism’s most bitter liars. The U.S. Interests Section (USIS), meanwhile, has been accused of interference and other similar epithets, which makes me reflect on other events taking place in that country, without the participants being harassed by hostile cameras and a phony press. I refer, for example, to the performance of the children of Cuba’s La Colmenita, in the public space in front of the White House in Washington D.C.; or to the street rallies in favor of the release of five Cuban spies that State Security freely orchestrates in the U.S. and in other countries sympathetic to this dictatorship. 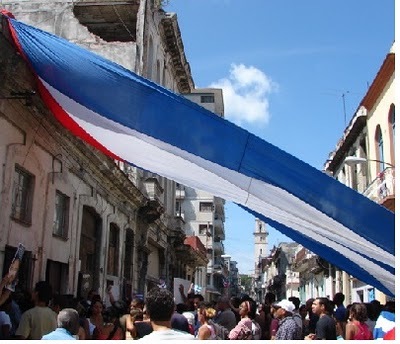 The leaders do not seem to care much that the Cuban government is promoting their revolution beyond the borders of the island. But it would not occur to me that he USIS, another embassy or simply ordinary Cubans, could meet to debate, whether it be press freedom or the survivability of insects, in any public place in this country. Sometimes it is not possible even in private spaces, as the Ladies in White can testify to; on Thursday, February 23, they were the targets of long hours of hatred and fury from the “repudiators” who, with complete impunity, convened by the powers-to-be, harassed them while they paid homage the memory of Orlando Zapata Tamayo on the second anniversary of his assassination; a blundering police and paramilitary deployment which closed off Neptune street, in the capital, to traffic and maintained a disturbance of the public peace, in what is officially a tribute to the martyr and a recognition of dissent. But there’s no point in crying over spilt milk. A government that feels it must harass dissidents so openly must be afraid. After this new media attack I just have to reaffirm publicly my position in a declaration of principles: in my capacity as a free citizen I claim the right to attend the events I myself decide of my own free will, without asking permission of the government; I do not receive financing or a salary from any government, including Cuba’s, and I refuse to abandon these principles under any circumstances; I am the absolute owner of my actions and my ideas and I am willing to vouch for them; I also publish and will publish my work and my ideas wherever I see fit. The gentlemen farmers should come to understand that not all Cubans are slaves on their endowment. Number 59100900595, my official inscription number in this island prison, was freed years ago by my own will and conviction. I would rather die than return to the irons. *The events at the psychiatric hospital were the deaths 26 mental patients due to starvation and cold. A very powerful and moving statement. Thank you. This blog is translated by Norma Whiting. 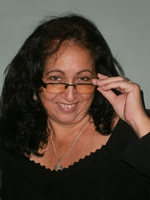 You can help translate other Cuban bloggers by clicking here. Miriam is a Cuban from Havana, and she belongs to the generation whose lives have been torn between disillusionment and hope, whose members reached adulthood in the controversial year 1980. She has published collaborations in the digital magazine Encuentro en la Red, for which she created her pseudonym.